…nothing is so alien to the human mind as the idea of randomness. Ryan D: Pattern recognition plays an integral role in the human cognitive process, with comic books being a particular medium which simply wouldn’t work without that ability to see and recognize patterns in visual symbols, icons, and shapes, as our brains wrestle a slew of static visual images into a narrative. The images are coherent because they are created together purposefully to be consumed in relation to each other. However, the human brain can still find patterns where there is no direct correlation. In 1958, the term “apophenia” came into being to describe that ability to take unrelated things and tie them together with connections which might not exist. We can observe this phenomenon every day in the form of confirmation bias, or, in more extreme cases, the claims of paranoid schizophrenics who may find the most benign details to be irrefutable proof of a grandiose conspiracy. So what happens if two seemingly unrelated people in different parts of the world — one embroiled in this hunt for clues in an outlandish pattern, the other just trying to adjust to a new life — both find the horrifying answer to what seems to be delusion? 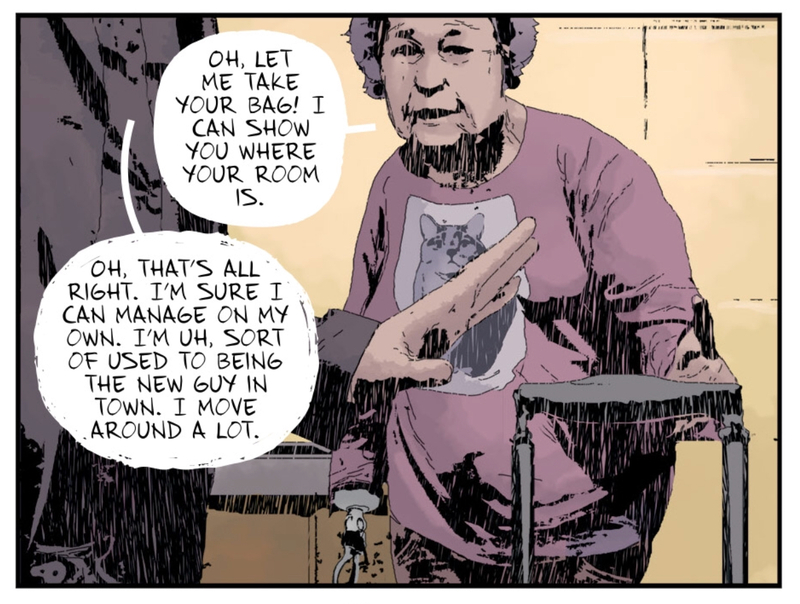 Herein lies the crux of Gideon Falls 1 by Jeff Lemire and Andrea Sorrentino, backed by a decorated team on colors and lettering of Dave Stewart and Steve “SWANDS” Wands. While there are several versions of the Lord’s Prayer depending upon which book the text is pulled from (both Matthew and Luke contain accounts of this prayer) and also the translation from Greek, most contain a line towards the end regarding “temptation.” While this usually refers to the temptation of the Devil away from the love of God, the line follows a plea for “our daily bread” — a material comfort — and could also be thought of as a warning against finding too much comfort in those material things or earthly pursuits, a pursuit such as obsessively collecting things, for instance. I love how Norton, while praying to God for forgiveness and support, leaves out the obsession which proves to be his most defining feature. When awoken by the ghastly spectre of the town’s former, departed preacher, we see Wilfred hurrying to put on his trousers to chase after the apparition. Just to the right sits his black suit coat and pants, the uniform which defines him as a priest, empty and independent of the man who should fill them. Wilfred follows into the field as a bare-chested man, exposed and without any of is clerical trappings or even a cross/crucifix around his neck, to face the waiting horror of the Black Barn — whatever that turns out to be! Gideon Falls 1 lays on the precipice of exploring some very interesting things after a visually enticing first issue, and I haven’t even had the chance to scratch the work being put in by the artists here. Mark! Can you talk a bit about how Sorrentino uses visual perspective in this title thus far, or a bit about how Stewart and Wands influence the tone, and if you think that the strong choices from the individual members of the creative team gel together for you, on the whole? Mark: One of the things I love about creator-owned books is that they often don’t contain “Written by” or “Art by” credits. 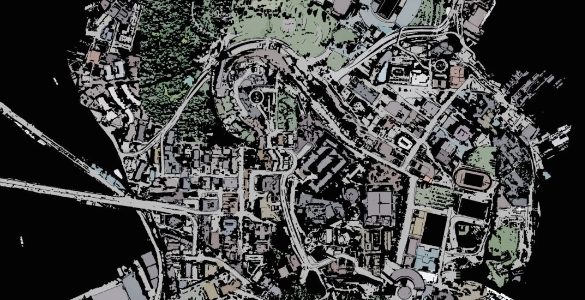 The division of labor behind the scenes might be divided one way or the other, but titles like Gideon Falls are presented as a collaboration, and comics only really work at their highest form when they are a collaborative effort. 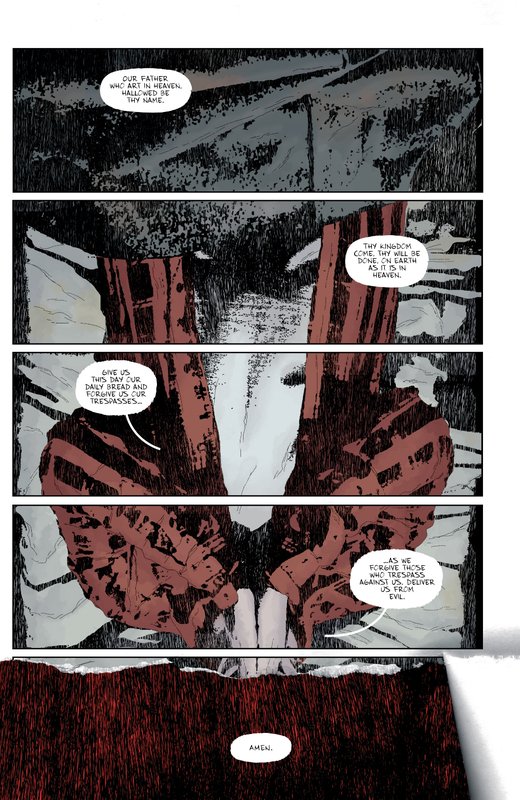 I have no idea what the production schedule of a comic like Gideon Falls is versus a monthly superhero title from DC or Marvel, but it seems evident that Lemire, Sorrentino, Stewart, and Wands are afforded some luxury of time to make considered choices. For instance, once you make it to the end of the issue and it’s apparent that red is used as a signifier of something touched by evil, going back through the issue is rewarding. You notice that Norton is dressed in a red button down shirt over a white undershirt; the red shirt isn’t the vibrant red we later see bathing Father Tom, it’s a bit more muted than that. It’s clear that Norton feels the presence of evil but he hasn’t been overtaken by it. His white shirt — white being a symbol of purity — still shines through. There’s a similar meaning in poor Gene Tremblay’s pink cat sweater. Mrs. Tremblay seems to be a good person, but she’s been unknowingly marked. Her purity is slowly being bled into by an unnamed evil — thus, her sweater is pink. The choice to dress Dr. Xu in all white marks her as the most uncompromised character in the book, but what to make of Father Wilfred’s black clerical clothing? If white represents good and red represents evil, what is black? This debut issue doesn’t provide much guidance, but I suspect the answer lies in whatever happened in Wildred’s past that caused him to “lose his way.” If Wilfred is lost, maybe the issue uses black to represent a third state of being: not evil, but also not believing in unwavering good. He’s on neither side, which is a lonely place to be during a war. How that relates to the menacing Black Barn Wilfred encounters in the middle of the wheat field and Norton sees in his visions? It’s too early to say. 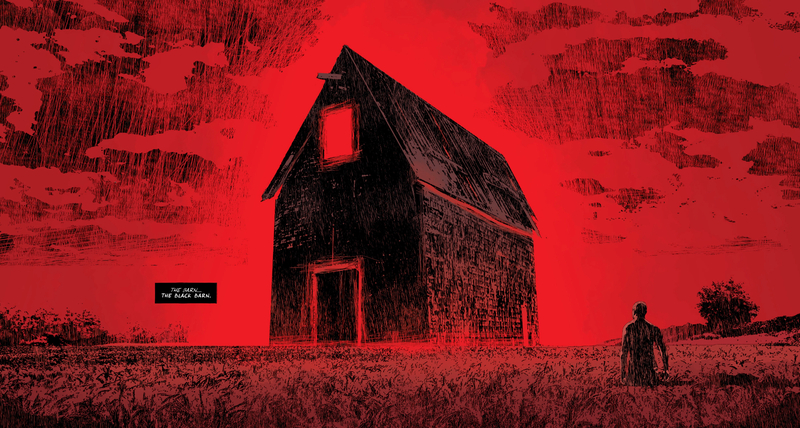 Gideon Falls 1 doesn’t offer up much in the way of answers on any front. In the Bible, Gideon is a man of faith who is empowered by God to defeat an enemy army despite being completely outnumbered. 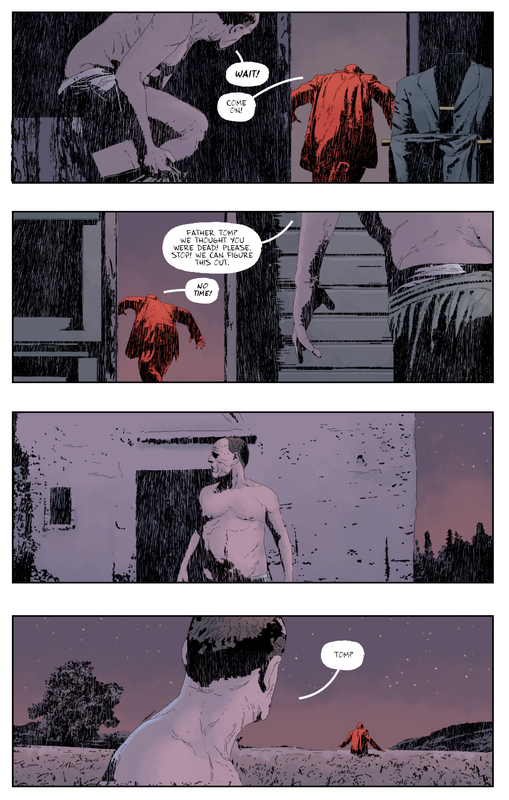 In Gideon Falls, the story seems to be leading to two men, Norton and Father Wilfred, standing alone against evil. It’s similarly dire odds. Funny thing about that temptation line in the Lord’s prayer: the pope also thinks it shouldn’t be there. Man I liked this. I didn’t catch that thing about colors (because I just never catch things about colors), but the story itself… I just got into it. Thinking about Nathan’s delusions, I thought a little bit about conversations I had about Annihilation, the movie. I’m the irritating movie nerd that read the book before going in to the movie. I read the book before I knew it was going to be a movie and I thought the book was fine. One thing the book did very well was convey the sense of confusion of the main characters. Something was very definitely messing with their minds. The movie did not do that – other than a scene at the start where they noticed days had passed but they had no recollections of it, everything else was pretty stock wildlife spooky horror stuff. The stuff that was happening in front of us was exactly as the characters perceived it. This was a pretty severe flaw with the movie, in my opinion. The loss of mental control and awareness was a huge factor in the horror of the story, but the movie either didn’t focus on that or didn’t care about that. I think this comic did a very nice job of showing us the harrowing delusions and the possible loss of control (although it’s comics, he may end up seeing the one thing that everyone is missing). But it very effectively showed crazy and how it was affecting him and how the things he saw and the things he felt were not necessarily the things that were real. I liked that quite a bit.